Tomorrow is the beginning of the enrollment period for the Affordable Care Act (ends March 31, 2014). For information specific to NH, click here. To get assistance locally, click here. From all we've heard, though, the enrollment procedure will be easy, and shouldn't take long. If you want to get an idea of how much a NH program might cost you, there's a simple cost calculator on the NPR site, click here. More "Adorable Care Act" images. There are four ways that one can enroll--by mail, by phone (1-800-318-2596, TTY: 1-855-889-4325), by computer, and in person. We have public access computers here at the Library for those who would like to apply online. However, we will not be able to provide users with advice about their personal healthcare choices. If you're interested in the law itself, you can find a summary here. 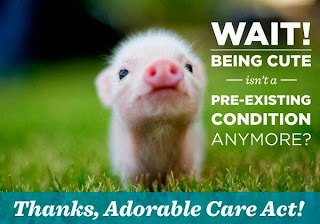 Additional links to information on the ACA can be found on our website. 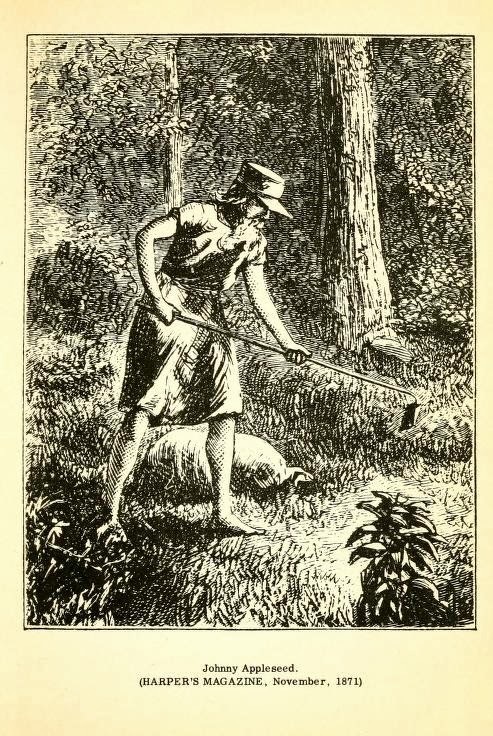 Yesterday was the anniversary of the birth of John Chapman, more commonly known as Johnny Appleseed. He was born on September 26, 1775 in Leominster, Massachusetts and died on March 11, 1845 in Indiana. We have many books in our children's room on Johnny Appleseed, including a comix version, The Legend of Johnny Appleseed: The Graphic Novel by Martin Powell [J CX MAR]. However, poems about the legendary man are few and far between. I found a very long poem about Johnny Appleseed, by Vachel Lindsay, which was first published in The Century Magazine in August 1921. It was reprinted in a collection, American Poetry, 1922: A Miscellany. The poem covers Chapman from birth to death, I'm only including a small part. from "In Praise of Johnny Appleseed"
And with "Yankee Doodle Dandy,"
And was "young John Chapman,"
American Poetry 1922 is available as a free ebook from Project Gutenberg. I'd recommending loading it on your ereader--it is a treasure-trove of poems by Robert Frost, Vachel Lindsay, Amy Lowell, Carl Sandburg, Sara Teasdale, Louis Untermeyer, and many more! 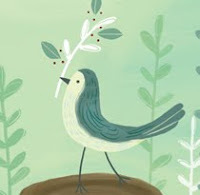 Visit my friend Amy Ludwig VanDerwater at The Poem Farm for the Round-Up this week. Illustration from Harper's New Monthly Magazine, volume XLIII, November 1871. I love to see difficult to comprehend concepts translated into concrete terms so that they are more easily understood. Jelly beans did the trick for me here! "38 Real Size Comparisons That Will Make Your Head Explode," is fun to consider. We've got a tree in our yard. It grows about six feet every year. If I had grown at the same speed, I'd now be almost fifty feet tall! I wouldn't really mind, except that I'd never get clothes to fit. For more size comparisons for kids, there's also How Big Is It? : A Big Book All about Bigness by Ben Hillman [J 153.752 HIL]. Have fun, and don't let the kids know they're learning math concepts--or maybe you should! Does anyone say "waste not, want not" anymore? I can't remember the last time I heard it. My parents used to say it quite frequently, but, they grew up in the Great Depression. We really should try to reinstate the expression. Many people are still operating with the 1990s mindset of "everything cheap and discardable." Perhaps the recent article on the Forbes magazine website is a sign that people are starting to come around to the idea of being more careful with how we spend our money. The article, titled "8 Things Recent Grads Waste Money On," may also be of use to people who long-ago graduated. 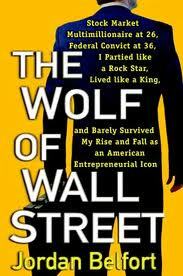 I recommend reading it, and clicking on some of the links. On Friday, The Eagle-Tribune headline read, "Bank Robber's Getaway Vehicle Was a Bicycle." 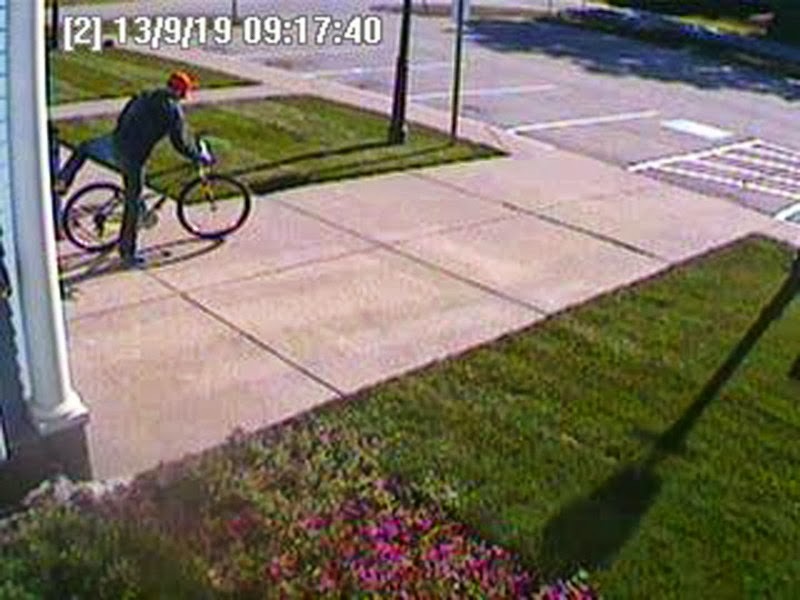 Yes, it's true, a man robbed a bank and made his getaway on a green mountain bike! There's even a photo of the perp making his getaway! Truth is stranger than fiction! Bank surveillance camera photo courtesy The Eagle Tribune. We have quite a number of films about robberies, but they don't include a bicycle! There is one film about robbers, however, which does include a bicycle, but not one used as a getaway vehicle--Butch Cassidy and the Sundance Kid [DVD BUT]. It's amazing how little I know! I knew almost next to nothing about dyslexia. I just thought it involved reversing letters. Then, I read a post on Imagination Soup in which the intricacies of dyslexia are explained. Reading explanatory materials such as this leads me to wonder about judgments I may have made about non-reading children, and I've come to the conclusion that there's always MORE to any person's story. Dyslexia, dyscalculia, and other learning disabilities are not uncommon. Fortunately, they are being recognized earlier in a child's life. To learn more, visit the 371.91 section where we have quite a number of books on the topic including Overcoming Dyslexia: A New and Complete Science-Based Program for Reading Problems at Any Level by Sally E. Shaywitz [371.91 SHA]. Some children have learned to muddle through, but learning disabilities can lead to problems once that child has become an adult and must earn a living. That's the reason why there are books such as Dyslexia: How to Survive and Succeed at Work by Sylvia Moody [331.595 MOO]! If you know someone who is dyslexic, be sure to let him/her know that many famous people such as Steven Spielberg, Keira Knightley, Thomas Edison, Albert Einstein, and George Washington were able to succeed despite, and maybe even with the help of, their dyslexia! The Gift of Dyslexia: Why Some of the Smartest People Can't Read and How They Can Learn by Ronald D. Davis [371.91 DAV] may be further proof that success is possible. 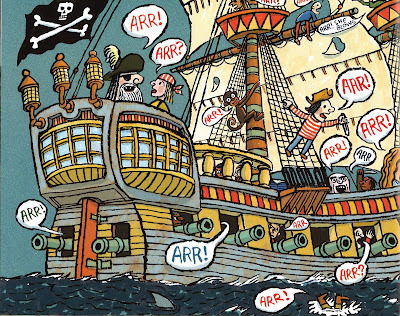 Poetry Friday--Every Day Is Talk Like a Pirate Day! Yesterday was the official Talk Like a Pirate Day, but, there's nothing that says we can't talk like a pirate on any other day. Why not today? To help us, I grabbed Shiver Me Timbers! Pirate Poems & Paintings [J 811.54 FLO]. The poems are by Douglas Florian and the pictures are by Robert Neubecker. I wrote about this book a year ago when we first added it to our collection. 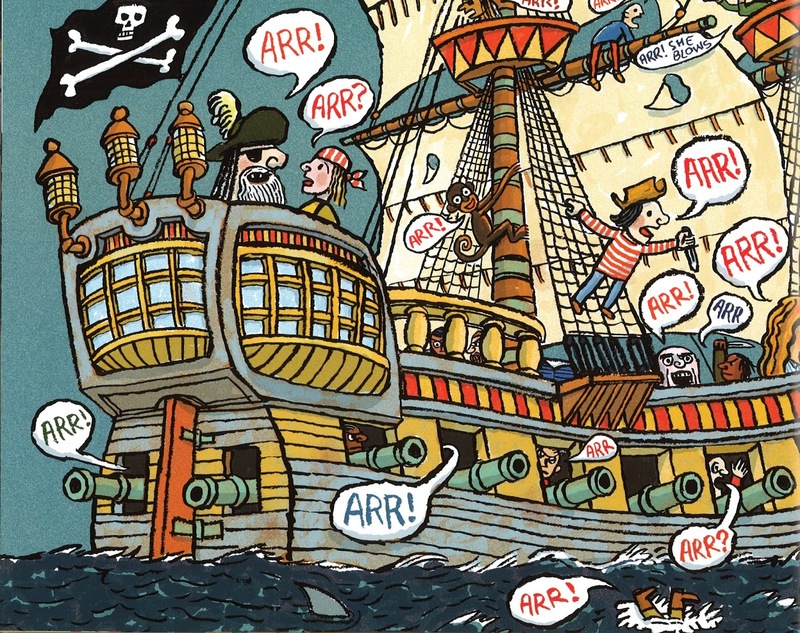 It's a book definitely worth revisiting, especially for Talk Like a Pirate Day! We call our ship a man-o'-warrr! We sail to ports both near and farrr! At night we navigate by starrr! We're hard as nails with many a scarrr! We're pirates, scary pirates we arrr! Head over to the Poetry Friday Round-Up being hosted today by Tabatha Yeatts--a lovely wench! The correct answer: Under my buckin' hat! It might be a good day to sit back, relax, open a nearly guilt-free bag of Pirate's Booty, and enjoy one of these pirate movies! Muppet Treasure Island [DVD MUP]. The Disney animated classic Peter Pan [J DVD PET]. Pippi in the South Seas [J DVD PIP]. Pirates of the Caribbean [DVD PIR]. There are several titles in this series, all staring Johnny Depp, the best movie pirate of all time! Treasure Planet [J DVD TRE]. 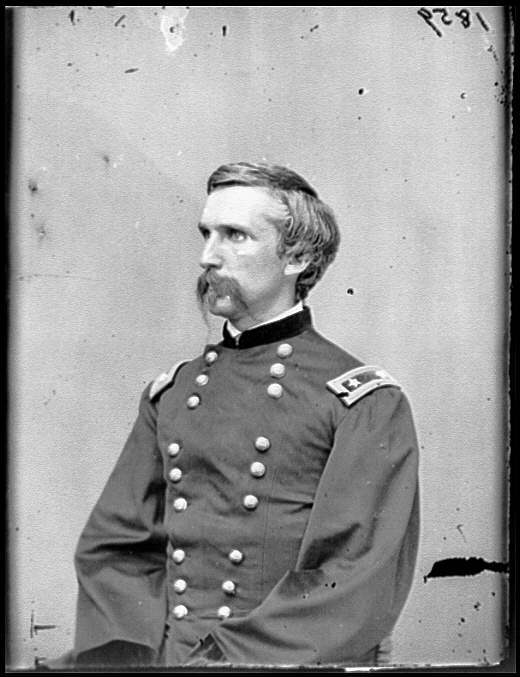 Last week, there were reports that Joshua L. Chamberlain's "Medal of Honor" had been purchased at a church sale, and was returned to Brunswick, Maine and donated to the Pejepscot Historical Society. Chamberlain was a noted figure in the Battle of Gettysburg. The battle took place July 1–3, 1863 in Gettysburg, Pennsylvania. The 1993 film, Gettysburg [DVD GET], recreates the famous battle. In it, Jeff Daniels plays Joshua Chamberlain. Besides Gettysburg, the movie, Chamberlain is also the subject of another film in our collection, Gods and Generals [DVD GOD], which is based on Jeff Shaara's Civil War novel of the same name. Shaara's other Civil War novel, The Last Full Measure [F SHA], also features Chamberlain. Do any of you remember Mimi from the Drew Carey Show? Mimi was played by actress Kathy Kinney. After the show ended, Kinney started a story website where kids can listen to classic stories such as Sleeping Beauty or The Brave Tin Soldier. The website address is simple enough to remember MrsP.com. Along with story videos, Mrs. P also has games, activity sheets, reading logs, and more. She also holds an annual Be-A-Famous-Writer contest, where children's stories can be submitted through November 15. The contest is for children in kindergarten through 4th grade. Mrs. P reads the winning stories, which must be a great thrill for the young authors! Writer Dan Gutman, author of the "A Baseball Card Adventure" and "My Weird School Daze" series [all J GUT], instructs kids in writing with My Weird Writing Tips [J 808.042 GUT], in case any of the kids in your life want to participate in Mrs. P's contest and would like to brush up on their writing skills. I'm sorry to say we don't have any books on dog choreography, but we do have a number of titles on dog training. Besides the ones on general dog behavior, we also have Dog Tricks for Dummies by Sarah Hodgson [636.7 HOD]. And, if you now have "You're the One That I Want" running through your head, come borrow the Grease soundtrack CD [CD SOUNDTRACK GRE] or the film [DVD GRE]. An elephant won't fit at all! when they're tucked inside a poem. Speaking of short poems, check out the new website, PoetryMinute: A Poem for Every Day of the School Year. The poems can be read in a minute or less, and should be an easy way for teachers to include poetry in the daily routine. 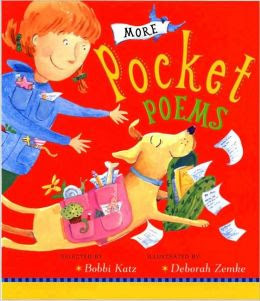 Teach Mentor Texts is the designated gathering place for today's Poetry Friday links. Be sure to stop by! In an effort to have less of an environmental impact, many of us are on the lookout for ways to re-use and recycle. I was recently introduced to a website titled, Earth911 through a Facebook post from a library friend. The post had a link to the Earth911 page on things to do with the eggshells after you've made the omelet. Check it out for yourself here. One of the things I like about Earth911 is the page, "Have something to recycle? Find out how and where! Get answers to all your recycling questions below or search for what’s available in your neighborhood." There is a "RecyclingLocator" where you can plug in your zip code to find places to take your items to be recycled. Kann, Victoria. Emeraldalicious. [JP KAN] Recycling magic turns a garbage-filled park into a "greentastic" garden. Klein, Abby. Save the Earth! [J KLE] To celebrate Earth Day, Freddy's first-grade class participates in a "go green" challenge where they must complete ten planet-friendly activities by the end of the week. Messner, Kate. Marty McGuire Digs Worms! [J MES] With help from her Grandma Barb, Marty builds a habitat for worms in her school cafeteria as part of the Save the Earth Project. Sid the Science Kid. Going, Going, Green! [J DVD SID] Sid the Science Kid goes to the local Science Center to learn about protecting the environment, conservation, and recycling. Say what? International Dot Day, is on September 15 (if schools are participating, then it may be the 13th or the 16th this year because the 15th is a Sunday). 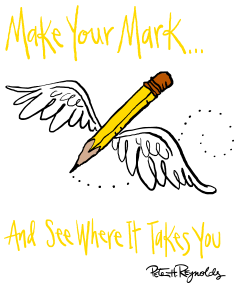 What it is is a day for kids (and adults) to make their creative "mark." There are over one million participants, in 72 countries, planning to take part in 2013! IDD was inspired by a picture book created by Peter Reynolds called The Dot [JP REY]. Publisher's description: Her teacher smiled. "Just make a mark and see where it takes you." Art class is over, but Vashti is sitting glued to her chair in front of a blank piece of paper. The words of her teacher are a gentle invitation to express herself. But Vashti can’t draw--she’s no artist. To prove her point, Vashti jabs at a blank sheet of paper to make an unremarkable and angry mark. "There!" she says. With a simple, witty story and free-spirited illustrations, Peter H. Reynolds entices even the stubbornly uncreative among us to make a mark--and follow where it takes us. There's no reason why everyone can't participate in IDD. If you need some inspiration, click here for The Dot Gallery. More inspiration can be found on the blog, Celebri-Dots, where authors, illustrators, and others share dots they have created. Let your creative spirit run wild! Vincent Van Gogh, who died 123 years ago, is in the news! A landscape, previously unknown, has been authenticated, an will go on display at the Van Gogh Museum on September 24. Also, a photo of one of Van Gogh's sunflower paintings, which was created in 1888, and was destroyed in Japan during World War II, has also been found! Amazing art news, don't you think? 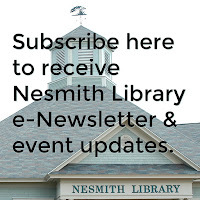 This is a good time to remind you about the 3M ebooks that Nesmith Library cardholders have access to through the GMILCS consortium. One of the 3M titles available is Van Gogh: The Life by Steven W. Naifeh. Bob Mendello, on NPR, recently gave a round-up of new movies coming out this fall. You can listen here or read the transcript here. We have a Library of America volume titled, Hart Crane: Complete Poems and Selected Letters [811 CRA]. Hart Crane is someone whose name sounded vaguely familiar, but if truth be known, was a poet of whom I had no real knowledge. Hart Crane was the doomed visionary of modern America, a poet enraptured by the wild energies and thwarted possibilities of a society rushing headlong through the cataclysmic transformation of the early twentieth century. "Doomed visionary..."--I would say so, the poor man died at 32, of an apparent suicide. He jumped off a ship in the Gulf of Mexico; his body was never recovered. You would think his work would be all sturm and drang, but the things I read weren't. Here's one from his collection called Key West, and although it's about a natural disaster, I don't find it depressing! Thy drum’s gambade, its plunge abscond! Thou ridest to the door, Lord! Thou bidest wall nor floor, Lord! The Hurricane by Hart Crane read by Tennessee Williams from Don Yorty on Vimeo. What do you think? I think it's a bit too perfectly enunciated. Not at all how I imagined someone who was out in the wind and rain and in a frantic panic would sound! I know it's still hurricane season, but maybe we won't have any major ones this year? We can hope. Head down to Maryland today, where Laura at Author Amok is hosting the Poetry Friday Round-Up. To start off the school year, show this video to your elementary school student! I'm not sure that he or she will develop superpowers, but your child may discover that reading can be fun as well as informative. Dog Breath! : the Horrible Terrible Trouble with Hally Tosis. Pilkey also has a very kid-friendly website with information on his books, games, and other fun stuff for kids to explore. Another recently opened exhibit at the Museum of Fine Arts is "Audubon's Birds, Audubon's Words." In this exhibit you will find prints from Audubon that are over 3 feet in height! As author and illustrator of The Birds of America, John James Audubon (1785–1851) traveled thousands of miles throughout the United States and Canada to seek out and draw North American birds in their natural habitats. In the book’s enormous pages—each more than three feet high—Audubon captured the full range of avian life in North America, including many exotic creatures. Produced in England and issued in a limited edition between 1827 and 1838, only about 120 complete copies exist today. This exhibition features prints from the MFA’s copy of The Birds of America and some smaller works by Audubon. The artist was also a gifted writer, and the exhibition pairs his birds with his words, offering insight into Audubon’s methods, obsessions, and the trials associated with his giant project. To see this exhibit, and any of the other awesome MFA offerings, borrow our Library pass (call 432-1744 or visit our website). Beneath the crackled and faded painting of a horse, underneath the worn and dusty floorboards of the dining room, lives Celeste, a mouse who spends her days weaving baskets, until one day she is thrust into the world above. Here Celeste encounters danger—and love—unlike any she's ever imagined. She dodges a hungry cat and witnesses the brutality of hunting for the first time. She makes friends with a singing thrush named Cornelius, a talkative osprey named Lafayette, and Joseph, Audubon's young apprentice. All the while, Celeste is looking for a new home. Is her home in the toe of a worn boot? Nestled in Joseph's pocket? Or in the dollhouse in the attic, complete with mouse-size furniture perfect for Celeste? In the end, Celeste discovers that home is really the place deep inside her heart, where friendships live. There are two new exhibits at the Museum of Fine Arts in Boston, that look interesting. 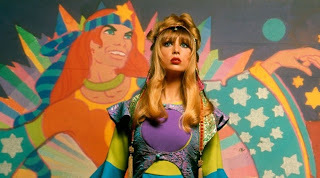 I'll talk about one, "Hippie Chic," today, and the other tomorrow. 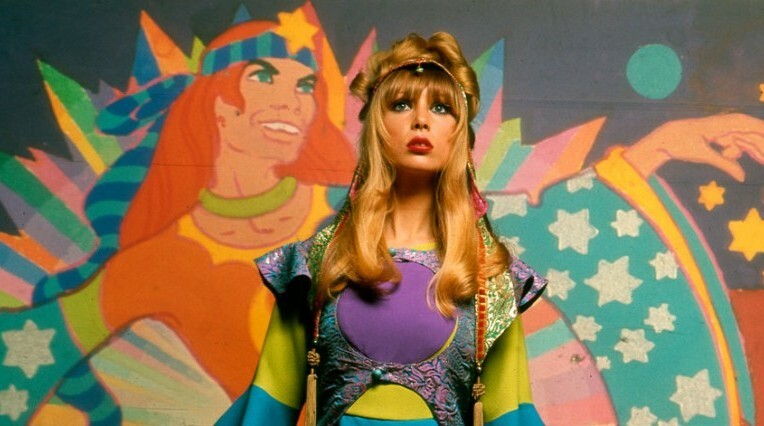 If you didn't live during the hippie era, perhaps you'd like to learn a little more? Look for The Counterculture Movement of the 1960s [306 COU] or The Harvard Psychedelic Club: How Timothy Leary, Ram Dass, Huston Smith, and Andrew Weil Killed the Fifties and Ushered in a New Age for America by Don Lattin [973.922 LAT] for the sociological underpinnings of the 60s. In case you had forgotten, I'd like to remind you about our Library Museum Pass program, made possible by the Friends of the Library of Windham (FLOW}. The MFA is one of the museums to which we have a pass; to reserve it call 432-1744 or visit our website). The Library is closed today to commemorate Labor Day. 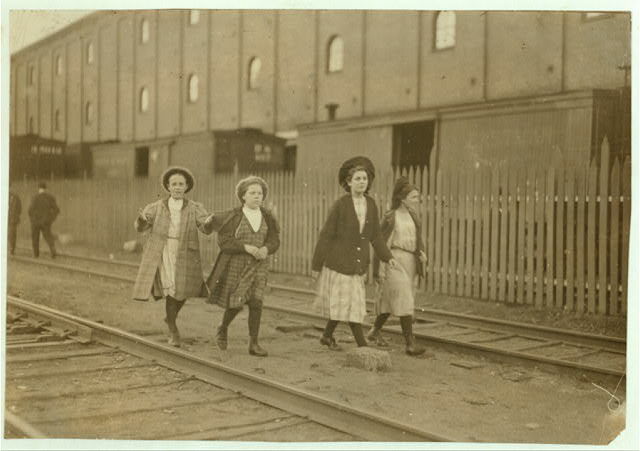 It should be a time for us all to reflect on the movement 100 years ago that brought the end to child labor, gave us the weekend as we know today, improved safety conditions for workers, etc. Group coming out Great Falls Mfg. Co., Somersworth, N.H. 6 P.M. May 18, 1909. Location: Somersworth, New Hampshire. 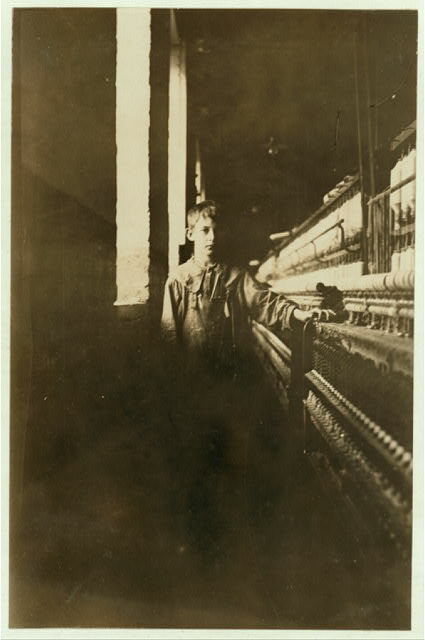 Small boy works as helper -- backroping in Great Falls Mfg. Co., Somersworth, N.H. Charles Chasse, 201 Main Street. When I inquired about him in the home, his mother very reluctantly admitted he was working, but said he is past 14 years of age. I met him on the street and he said he is to be 14 next month, when he hopes to get his "school papers." Said he has been working several months. Location: Somersworth, New Hampshire. 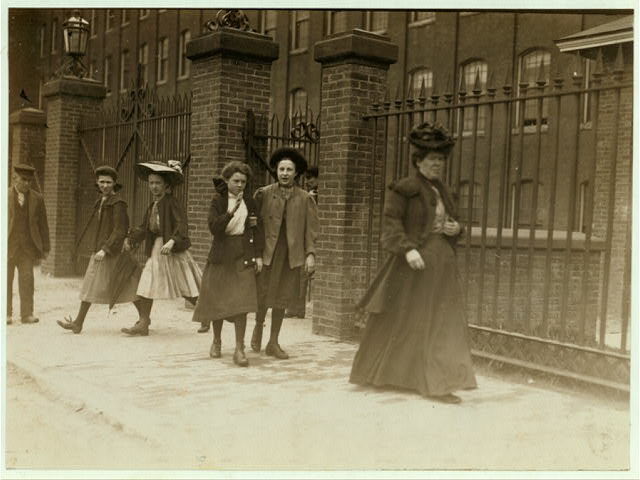 Noon hour, Cocheco Mfg. 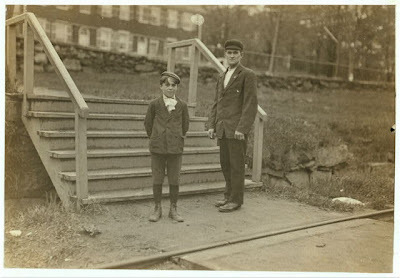 Co., Dover, N.H. May 17, 1909. Young girls working regularly. A number of others there, some even younger. Location: Dover, New Hampshire. Small boy working in the Amoskeag Mfg. Company, Manchester N.H. Said he has been there several months. Photo at Noon, May 25, 1909. Location: Manchester, New Hampshire.